Hookah tips and hookah filters are convenient hookah accessories that insert into the end of your hose. Hookah tips provide a sanitary way for more than one person to smoke with the hookah at the same time. Hookah filters make smoking hookah cleaner for everyone. There are many sanitary reasons why you?d want to use hookah tips for your everyday hookah sessions. When smoking with friends, the normal practice is to just pass the hose around. However, if someone is getting over a cold, hookah may not be the best idea. However, with a hookah tip, you don?t have to risk spreading germs around. Everyone can use their own mouthpiece to reduce the chance of sharing something nasty with the whole group. 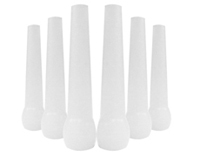 Choose from Narrowor Wide hookah tip mouthpieces. These can accommodate any size hose you may have and come in bags of 100 inserts to get you a great value for your money. They are made by well-known brands Vapor and Exotica, so you know you?re getting a good product. 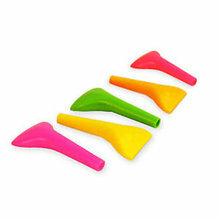 Fan shaped hookah tip mouthpieces are designed to fit comfortably to your lips. 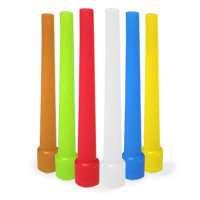 These fit most narrow sized hoses and offer an ergonomic way to smoke hookah. 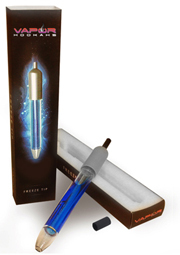 Have you tried the Vapor Freeze Tip? This marvel of hookah technology cools down hookah smoke to offer you the smoothest, most refreshing hookah experience. This is a high quality hookah tip that you can reuse again and again after a quick wash. Pair it up with hookah flavors like Watermelon or Double Apple for cool summer fun! An additional feature of these hookah accessoriesis they regulate how much smoke comes out of the hookah. This offers smokers a more pleasant, relaxed smoking experience. A hookah filter offers you cleaner, healthier hookah smoking. Over time, hookah hoses can accumulate particles or tobacco fragments that can lessen the hookah experience. A hookah filter attaches to the hose and traps these particles, preventing them from getting in your mouth and ruining the whole experience. Simply insert a small cotton ball (not included) into the filter before smoking. 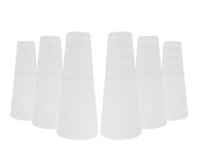 We sell hookah filters in packs of 10 for your convenience. For an affordable price, you can practice safe and clean hookah smoking with hookah filters and hookah tip offerings from SouthSmoke.com!